HTML5 Audio Tag Element Represents a Sound or an Audio Stream. Embedding MP3 Such as Own Podcast in WordPress Single Even One Post is Easy Without any Plugin. Earlier, we discussed about HTML5 Vocabulary and Interfaces. HTML5 provides a standard for playing audio files. Before HTML5, there was no standard for playing audio files on a web page. Before HTML5, audio files had to be played with a WordPress plugin (like flash). However, different browsers supported different plug-ins. HTML5 defined a new <audio> element which specifies a standard way to embed an audio file on a web page. So, this is true that; we can include HTML5 Audio Tag Element and Provide some way to Play an Audio Stream within a single Post. There is, at least one WordPress Plugin named oEmbed HTML5 audio plugin which is intended to add audio file on WordPress Post. In this case, one need to click on Add Media button to upload audio file from your computer. One can upload files in mp3, ogg, and wav formats. Once you have uploaded the file, copy file location and paste raw URL in your post. The plugin will use HTML5 audio tag element to automatically embed audio file from your URL. Currently, Firefox does not support oEmbed HTML5 audio for MP3 files so the plugin falls back to a flash player instead of HTML5 when it detects Firefox. Google Chrome and Opera supports all the features specified in HTML5 Audio Tag Element, unfortunately; we need an unified looking Player on all these Browsers. This indeed, quite closer to this fact – we could host the above code, but we have used Github Gist. For block of codes; NOT ALL, really works great with self hosting and using a syntax highlighter. By now, we know how to use WP Enqueue Script For WordPress Themes. As all posts has an id like ( post=722 ) we can conditionally load them, simply move your functional code to theme’s functions.php file and wrap the function contents in an if ( is_page( ‘page-with-form’ ) ) conditional argument. 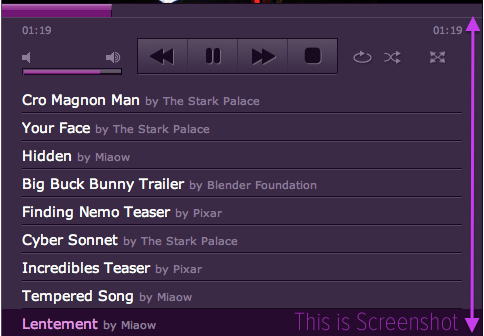 We talked about another Audio player on this post – Cloud Files Hosted Music Player of Your Own. You can (as a last effort) iframe your own such self hosted player on plain HTML page. This Article Has Been Shared 1769 Times! Create Own Icon Font From Image Icons – Here is How to Change Any Type of Images to Icon Font and Use With CSS. Base64 Encoding Can Result in Faster WebPage Loading. Blurred Text of Content Area is Required to Force the Reader to Login to Perform Some Action. Here is How to Get Blurred Text Like Quora. Fix Sudden Error Establishing a Database Connection WordPress By Following Our Logical Flow Chart Without Taking Much Sudden Headache. Add Post Thumbnail to RSS Feed in WordPress in Very Easy Steps to Make Your Feed and FeedBurner Delivered Newsletters More Interesting. Cite this article as: Abhishek Ghosh, "HTML5 Audio Tag and Embedding MP3 in WordPress Post," in The Customize Windows, February 23, 2014, April 26, 2019, https://thecustomizewindows.com/2014/02/html5-audio-tag-and-embedding-mp3-in-wordpress-post/.